I want to make a slideshow for my daughter’s upcoming wedding, any recommendations on a good wedding slideshow software? To showcase photos on wedding days, slideshow can be a good choice. During the wedding reception or ceremony, a wedding slideshow can boost the atmosphere. A slideshow DVD is a precious gift for couples to recall their best memories. When my elder sister showed me her wedding slideshow, I could really read her happiness from her smiling expression. No matter you want to create a slideshow for your friends, daughter / son, or yourself. I could say that you have made a wise decision. It will be an irreplaceable gift to share and preserve your happiness. 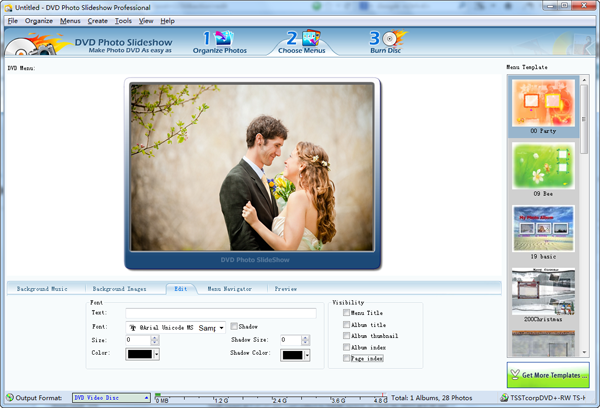 Regarding software to make wedding slideshows, DVD Photo Slideshow can be a satisfying choice. Whether you want to make a wedding slideshow DVD for playing on TV or DVD player, or create a wedding slideshow video for sharing to Facebook / YouTube, DVD Photo Slideshow can provide an easy solution. Besides, its diverse video output formats make it possible to view your wedding slideshows on kinds of devices, such as iPad, iPhone, Android smartphone, PSP and more. Launch DVD Photo Slideshow on your computer. Click Organize Photos tab to start a slideshow. Drag photos that you want to use in the wedding slideshow from your computer to Album Photo area, or use the Add button to import photos. If you have putted all photos that you want to use in the slideshow in a folder, open the folder in file folder list panel(upper part of the software screen), and click Add All to import all photos in the folder. After adding photos, you can drag and drop photos to arrange photo order. Wanna add captions on the photos? Then click Text icon. Under the sub-tab Transition & Music, you can select transitions and add background music for the wedding slideshow. Also you can set time duration for slides and transitions here. Go to Album Theme area, choose a beautiful wedding theme template . Then preview the slideshow in Album Preview area. 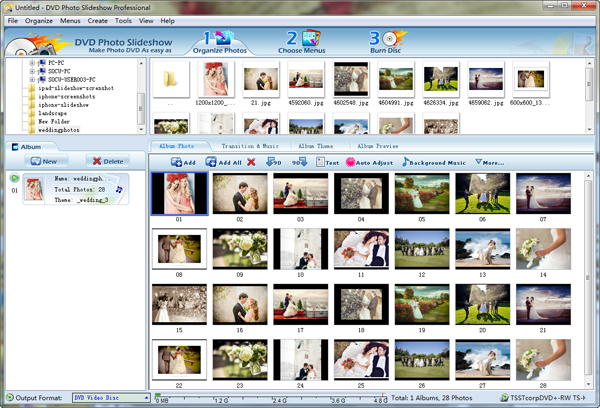 Click Choose Menus tab to choose and customize a DVD menu for your wedding slideshow DVD. Select a menu template from the right templates list. Then customize it with background image and music,and edit menu title, etc. Then click the Preview to view the DVD slideshow. Now switch to Burn Disc tab. Click Output Format drop-down list and choose a way to save the slideshow. DVD Photo Slideshow provides different ways to save a slideshow, you can burn the slideshow onto DVD / CD , or output as a video for YouTube / Facebook / iPad / iPhone / PSP . Or you can save it as SWF flash or web album. This entry was posted in DVD Photo Slideshow and tagged create wedding slideshow, make wedding slideshow dvd, software to create wedding slideshow presentation, wedding slideshow software on April 12, 2013 by Sarah Jablich.